One of the saddest things about having an online shop is that it’s fun to see how a store displays it’s wares. So I thought I’d give you a peek at the shelves in our brick and mortar store! Our merchandiser, Meghan, does a great job of making all of our products and lines really standout, doesn’t she? 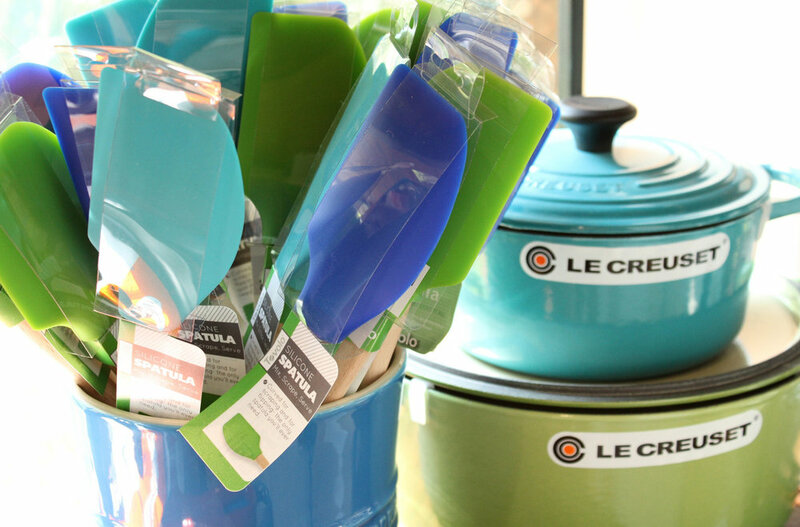 Tovolo Spatulas and Le Creuset Dutch Ovens – I just love this color palette! Give me well made coffee please. These Alessi Espresso pots are beautiful and functional. There’s something about these Le Creuset Kettles all lined up in a row that reminds me of ducks, rainbow ducks.